Often, when I was looking for questions to answer on StackOverflow, I would go through newest unanswered questions and look for those that had one of my favorite tags. The “my tags” tab is not very useful for me, because questions listed there are quite hard most of the time. So, I created this simple WPF app for myself and people with similar needs. You can copy & paste your favorite tags from SO, SF or SU and you won't see any of those boring Java questions anymore. Written in C#, uses StackOverflow.Net. Available from the git repository at github. 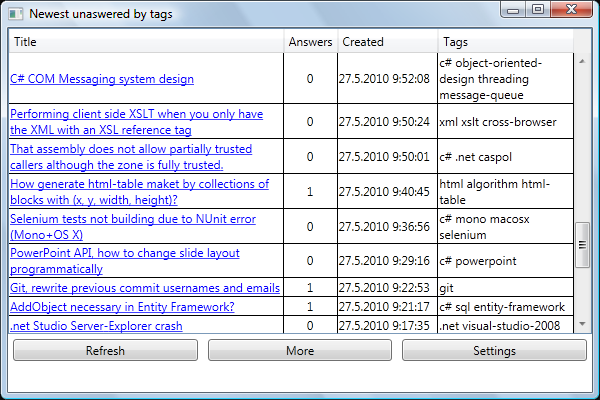 Browse other questions tagged app questions c# unanswered wpf .